Solar electricity systems capture the sun’s energy using photovoltaic (PV) cells. The cells convert the sunlight into electricity, which can be used to run household appliances and lighting. Do I need a south-facing roof? 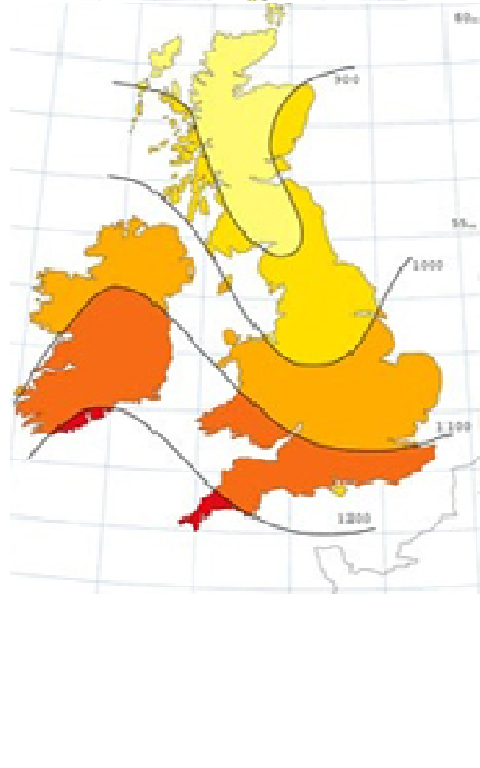 A shade-free, south-facing roof is best but 45º off’ south (eg. S-by-SW or S-by-SE) will only result in a 4% loss in potential energy. The best slope is between 25 and 40 degrees. Not unless you live in a listed building or a specially designated area of conservation. Keep the panel away from the edges/roof line and you should be fine (check with us or the Highland Council Planning Department if you need more information). Does the PV system have to go on the roof? No. If you put your panels up in your garden you can still get full FiTs payment as long as the power goes into the house like a roof-mounted system. However, such a system requires Planning Permision if it exceeds 9m2. What might a typical system cost ? What is the FiT rate for solar PV? It would seem that we do. This is clearly shown in the map adjacent. We can expect around 700kWh per square metre annually, about the same as the scottish borders or the north of England. Here at LEG we are putting together a data set of actual generation amounts from PV systems around Lochaber. Current results show that for every kWp, Lochaber systems are generating between 660 and 830kW. In other words if you had a 4kWp system you could generate 2640-3320kW per year. Earning you approx £354-£445 in FiTs. Which PV panels/brands are the best? This is never an easy question to answer but have a look at this comparison charts which can be found throughout the internet. When considering investing in electricity generating solar photovoltaics (PV) one question which naturally springs to mind is ‘how much electricity can I generate’? For if you know what you will generate you can work out how much you will receive in feed-in-tariffs (FiTs) and perhaps also what you could save by using your self-made electricity rather than buying it from the grid. ‘Google it’ and stumble across one of the many websites which will predict generation amounts for your roof/postcode. Invite round some solar energy companies to assess your roof and provide generation predictions. Do a study on generating capacities of units already installed in Lochaber! Well here at LEG we thought we would have a go at option c on your behalf. Six installations around Lochaber have kindly sent in their monthly generation amounts (some which go back to 2010) as well as specification details regarding their PV panels. This has allowed LEG to create individual average monthly generation amounts, and then also generation amounts per kW- so that the different systems can be compared. 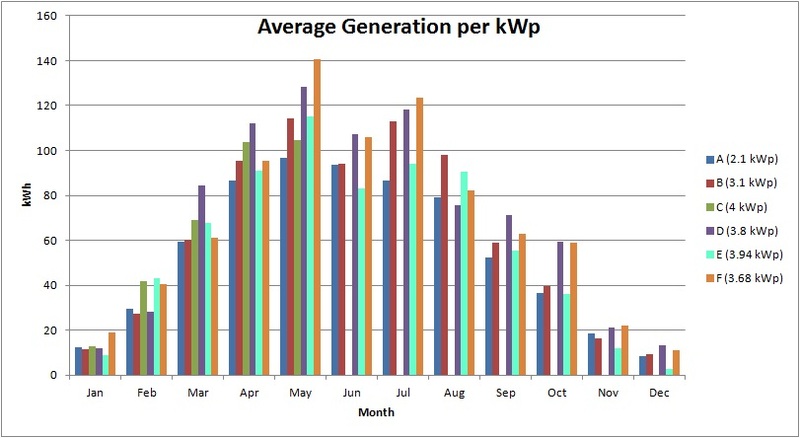 The below graph shows the total average monthly generation amounts for each of the systems. System D had the highest average with 3160.5kW generated annually. However, as you will notice not all the systems have the same generating capacities. This is referred to as the kilowatt peak or kWp; the amount of kilowatts that the system is able to generate in perfect conditions. A 4kWp system is bound to generate more electricity than a 2.5kWp system, so in order to compare the generation amounts of the systems we need to take into consideration the maximum generating capacity of each installation; its kWp. 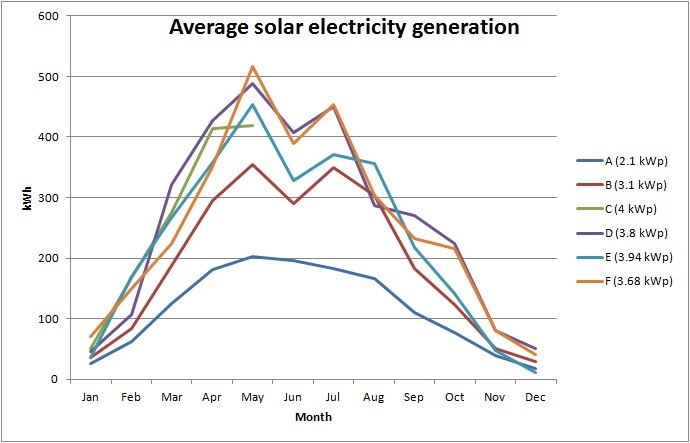 The graph below again shows the monthly average generation of each system but this time divided by the kWp. The variance between the best performing PV panels and the least is around 170kW with the average generating amount per 1kWp installed at 750.8kW (only taking into account the systems that have at least a full year of data). But what does this mean for Lochaber residents? Well from our results (which we fully admit are not sufficiently large enough to make it into an academic journal!) you can expect to generate somewhere between 660 and 830kw per kWp installed. Or in other words if you install a 4kWp system (the maximum amount allowed before FiT levels are reduced) you could generate between 2640 and 3320kW per year. At current rates (Aug 2013) this would earn you around £455-£570 in FiTs per year (taking into account selling 50% back to the grid). You would also save money on your electricity bills by buying less electricity from the grid but as this is based on personal behaviour putting a figure to the saving is beyond the skills of this blog. If you have a solar PV system on your roof, and are happy to share your generation results we would love to hear from you- the more results we collect the more accurate the findings will be.